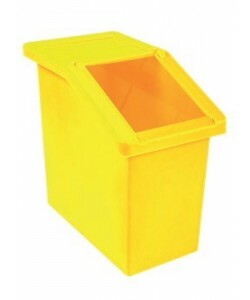 Within our rotoX range of plastic products, we manufacture a range of table top and static food ingredient dispensers, commonly used throughout the food manufacturing and food processing, commercial kitchens, hotels, bakeries, food factories for storing dry food stuffs such as flour, salt and sugar. 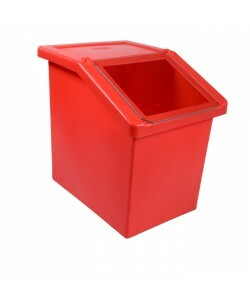 Our food ingredient dispensers are manufactured in our own UK factory using food grade, food contact approved, polyethylene material. Our ingredient dispensers are available in a wide choice of colours options, so you can use colour coding to segregate food stuffs. We also offer durable acrylic labelling to identify contents. Incorporating a slimmer design than the others, the rotoXTK15 is ideal for under counter storage and is perfect for when storage space is at a premium as it can easily fit in beside food preparation areas. The rotoXT15 is also compatible with our rotoXF15 ingredient dispense trolley, enabling you to store a range of different ingredients or food products ready for dispense all in our place. Produced in our UK factory, our range of food ingredient dispensers are all produced via rotational moulding, and are of a food grade quality. 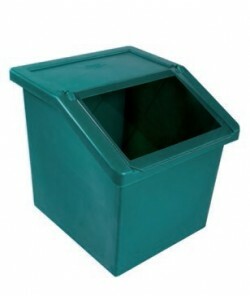 Ideal for food contact applications, the food grade polyethylene plastic is incredibly strong and the caterbins themselves harness a crevice free and seamless construction. Easy to clean and extremely hygienic they offer an exemplary means for ingredient storage and dispense, and are a popular choice within the catering industry. Equipped with matching coloured plastic lid and a clear PETG plastic flap, each of the food ingredient dispensers is designed to allow quick and easy filling or dispense of ingredients. 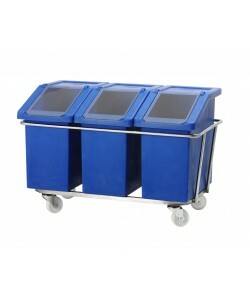 Three models are available, including the rotoXTK15 with a 65 litre capacity, the rotoXTK20 with a capacity of 90 litres and finally the rotoXTK35 (150 litres).